INFERNAL MACHINES - A RUSSIAN COUNTRY HOUSE. In this chapter will be found further particulars of the "infernal machines." I have thought it well to enter into these details, seeing that the "infernals" were the forerunners of the submarine mines of the present day. On Thursday we left Cronstadt in the fleet, and moved down to Seskar. From Seskar I started on Friday for Sweaborg, with a letter to the general commanding respecting the murder of the Cossack's men. We reached there Saturday at noon. I went in by a new passage through many rocks, trusting to the admirable Russian charts, and knowing they had been putting down infernal machines in the usual channel, which would not at all respect a flag-of-truce, if we ran foul of them. I anchored just out of gun-shot, and a boat came off to us. We had one of Her Majesty's table-cloths flying, and a table-napkin for the boat if wanted. The Russian boat would not, as before, come alongside, but laid on her oars a short distance off, so I went to her in the gig with Crowe, the interpreter. The officer was very grumpy. I told him I should have gone in the boat at first had not his admiral last year requested no boat should leave, but that they would send one alongside. He said he had nothing to do with that, but had only to obey his orders. I gave him the letter, and he returned. We remained at anchor twenty-eight hours, till 2 p.m. yesterday, when my friend came out as before, and I went to him. He brought a letter nearly a foot square, with a very grand black seal the size of a watch. He was much more gracious, actually smiled, so I shook hands with him on parting, and we came out; but he hung to and fro in the boat near us, till we were fairly going out the way we came in, when he pulled back. I thought he might be watching to see if we went out by the old passage, to warn us if there were really 'infernals' there; but perhaps I gave him credit for too much honesty. We joined the fleet here soon after midnight. It was so light that some of our men were reading on deck at midnight. You will be glad to hear that the Russian general's answer tells me that none of Cossack's officers were killed, only the five men in the boat and my poor Finnish captain - several others wounded. I hope it was a mistake. They did not observe the flag-of-truce; and he says, with some reason, that a flag-of-truce should only go to a large place like Helsingfors, or that prisoners we want to send back should be landed on an island. In this he is right, for I had landed some last week, and would not put them on the main, but sent them to an island. We are all delighted at the news from the Black Sea. I am glad George is in the Sea of Azoff. They have done their work well. Off Cronstadt, Thursday, June 21st. We have again moved up to Cronstadt, but only for observations. The chief will not, I think, attempt anything without a proper force. My plans were drawn up for eight floating batteries, thirty gun-boats, thirty mortar-boats, with four large frigate-steamers. We have one such steamer and two batteries coming, and about half the gun-boats and mortar-boats. We might try a good deal if we had the floating batteries, even with the small number of other kinds; but I am sure we could not have a chance of success without six at least: it is a pity they send any, if only two. The chief has written very decidedly and firmly about it, and I could not but feel pleased at his mentioning my name in the way he did: he only quotes the opinions of Admiral Seymour and myself, and he says I am the most anxious and sanguine about doing what we could at Cronstadt. I do not think we can try anything here with the force coming, and we shall merely watch, and perhaps try mortar-vessels, etc., elsewhere, where we can do so without risk and without the need of floating batteries. I am sorry we came up here, as, if we can attempt nothing, it would be better to keep out of the way, only preventing any coasting trade. Though I am sorry on public grounds that all the force was not sent out, yet it is a consolation that much bloodshed will be spared; and I could not look at the quiet-looking, pretty buildings, churches, etc., which the sun shone on beautifully this evening, without feelings of regret that war should make it a duty to carry on such a fearful work against them as a bombardment would be. It is lovely weather, cooler than last year, and I trust will continue much healthier than then. Sabine tells me she saw in some paper Merlin is called 'Dry nurse to the Duke.' I am sorry for such expressions, as it may annoy the chiefs and make them more shy of consulting me; but I find the officers of Duke gave us the name, and mentioned it before Creyke and others here. I have not seen the chief for two days now, and I have heard nothing more about what I told you I thought would be done soon; but I think with all the mortar-boats out here something must be tried. I do not think anything very decisive could be done, and I doubt if it is not better to stick to the shutting up of the coasts; but as a good deal of damage may, I think, be done with very little risk to us, it ought to be tried perhaps. The admiral has a difficult game to play and a very heavy responsibility, and the difficulty is increased by the divided authority with the French admiral. I am very sorry now that I led the Admiralty to think so much might be done. Had I known that we should have had no floating batteries ready, and so many fewer gun- and mortar-boats than was intended, I would at once have advised that nothing but a very close blockade should be attempted, and the destruction of all their coasting trade. We sailed from Cronstadt yesterday at 8 a.m. with all the fleet, but Duke, Exmouth, Euryalus, Vulture, Princess Alice, with four mortar-boats and one gun-boat (sic). These came on here, and we arrived this morning at 7 a.m., so that we have again a quiet Sunday. You recollect my mentioning about two months since going near the village at Hogland, and a young lady in pink coming down close to us and tripping back to the house. Yelverton has been there several times, and the house is the residence of the head man, a sort of magistrate or governor of the island. Yelverton asked him with his wife and daughter off to dinner, but he was afraid to accept, saying he dared not go on board, and could not unless forced to go; so, when dinner was ready, Yelverton landed the jolly-boat boys, armed with drawn cutlasses, and then marched the father, mother, and daughter down to the boat, and they apparently enjoyed their dinner very well. They enjoyed the joke more, probably. I fear the poor people on the coasts are suffering fearfully. Occasionally a boat is stopped trying to get into Cronstadt. One poor man said his wife had urged him to risk it, as they were actually starving, and that it was better to do anything than starve. It is very sad, but it is the only way we can make them feel the war, and I fear we must even destroy all their coasting-vessels without mercy, or we cannot shut up the trade at the end of the season, when our vessels dare not risk being caught in the ice. We came up here again from Seskar on Wednesday, and are anchored on the north side of the island, except five cargo-ships off the south entrance by the lighthouse. On Thursday afternoon I saw that boats were creeping in different places, and one of the officers said he thought they were looking for infernal machines, and they had had some explosion at Exmouth; but I thought nothing of it till yesterday morning. To my astonishment I found that Vulture had exploded an infernal machine in the middle of the fleet, though we had led the fleet up through the very place and were anchored inside all. This made them hunt for them, and several ships soon crept up some. I have tried to describe them in the sketch. They are made cone-shaped of strong zinc, about two feet deep, and fifteen inches wide at top. 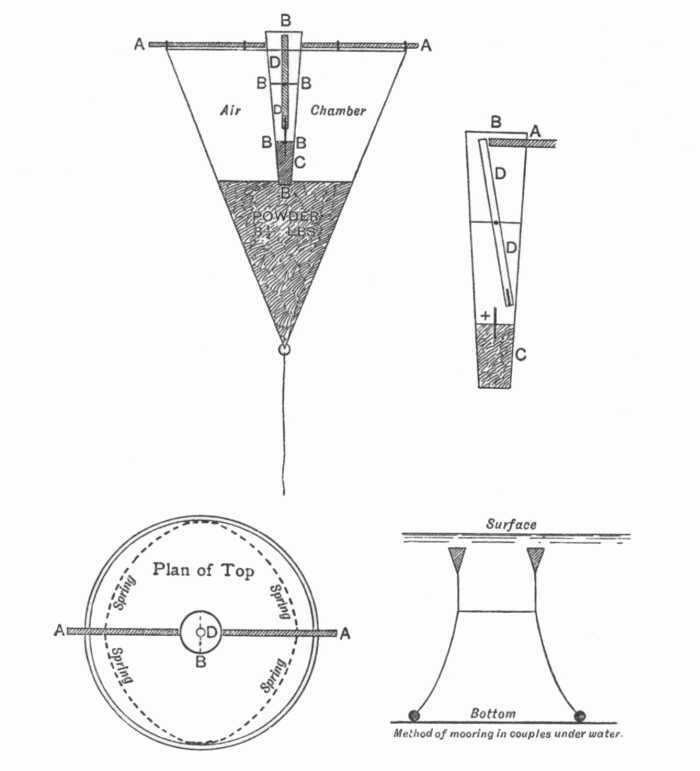 The bottom holds the powder, about eight pounds; the top is full of air, to keep it up; a strong tube (B B B) goes through the top, and reaches the powder; a small tube about the size of a lead pencil is hung in the centre of the large one (D D) - it pivots on its centre; and fixed in the bottom of the large tube, in the little chamber of priming-powder (C), is a small glass tube (+), sticking up into the bottom of the small tube. You will see that if anything pushes the upper end of the small tube on one side, as I have tried to show in figure 2, as it is pivoted in the centre, it must break off the glass tube, which is filled with some ignitible stuff, which fires the priming-powder (C), and of course explodes the machine. Now the two thin tubes of iron on the top (A A) slide to and fro, out are kept away from the tubes by slight springs. On being touched by a ship's side, or even pressed with a finger, they shove the small tube aside, as in figure 2, and explode the machine. How any were hauled into boats without exploding seems marvellous; but some lost their tubes when canted up to be hauled in; others had been put down with caps on the tops, which prevent their going off. These ought to have been removed; but the parties putting them down had been so afraid of them, they had preferred leaving them safe for us to risking removing the caps themselves. I don't know what the Grand Duke will say if he knows this! Admiral Seymour and Hall got one up, and hauled it over the bows of the gig. How the little slides were not touched is wonderful. It was then passed aft; and the master of the fleet joining them, they, thinking it was damaged with wet, got discussing the way to set it off. Stokes touched the slide, shoved the tube a little on one side, but evidently not enough to break the glass tube. They then took it to Admiral Dundas, and again they all played with it; and Admiral Seymour took it to his ship, and on the poop had the officers round it examining it. Hall, being in the act of hoisting a second one, was on the quarter-deck. Some of the officers remarked on the danger of its going off, and Admiral Seymour said, 'Oh no; this is the way it would go off,' and shoved the slide in with his finger, as he had seen Stokes do it. It instantly exploded, knocking down every one round it. As Hall looked round he saw the captain of marines, a son of Sir John Louis, carried down the ladder, with every bit of clothes burnt off him and covered with blood. He then heard, 'The admiral is killed.' The latter was lying insensible, his face covered with blood; but he soon recovered, though very seriously injured in one eye and the head. The poor captain of marines had pieces of the machine in his legs, besides the burns. Pierce, the flag-lieutenant, much hurt, a piece of iron going through the peak of his cap, and knocking it into the mizzen-top, but not touching his head; a young volunteer also. The signalman holding it up at the time not very much hurt, though burnt; and one lieutenant and the chaplain, though next to Admiral Seymour and close to it, only had their hair singed, and were not hurt at all. Two or three men also slightly wounded. It is a wonderful escape, for pieces of it flew down the main hatchway; and we know that the Russians getting one into a boat exploded it, and killed seventeen men. Admiral Seymour is much less hurt than was first supposed, as he is able to sit up to-day; but concussion of the brain is what they fear. He can see a glimmer of light with the eye, so it is hoped he will recover the sight. The marine officer's is the most dangerous case, but it is hoped he is doing well also. Yesterday Creyke and I went with two boats to buoy and examine the shoal off the new batteries, where in Merlin we shoaled to twelve feet the first day, and put a buoy on it; and it is very fortunate we did not ground, as there is ten feet only in one part, and it is only two thousand nine hundred yards from the guns, and they have since put a target on the spot and have been practising at it. I then in the evening asked the admiral for a gun-boat to go down to the lighthouse to get some more angles, and took the Magpie, commanded by an old surveyor, Lieutenant Pym (the officer who first discovered Captain Maclure and the Investigator). This morning the admiral sent a boat to ask me to come to breakfast, and then take him in to have another look at the north side. We started at 1 p.m., Dragon with us. Just as we were starting, Ramsay of Euryalus came, and the admiral asked him to come, 'if he did not mind risking being blown up.' I thought we must have come across some of the 'infernals,' as we were going into the most likely ground; but we did not touch one. There was a line of steam gun-boats inside the dam; and not having any idea their guns had such long range, I should have anchored where we did once before; but having got shoal water farther out in another position, and there being no boats about, we determined to anchor there and push in in the gig. The admiral came with-me, and we pulled in towards three new corvette block-ships, placed since we were last in; and keeping, as I thought, a respectable distence from the steam gun-boats, we pulled on till we shoaled to ten feet. We saw a gun-boat fire occasionally; we could not see any shot fall near us, though the Merlin hoisted the danger-signal to us. ... We went on sounding. ... The firing had been at Merlin; one shot had dropped just under her stern, though she was three thousand seven hundred yards from the gun-boats inside the dam. We had been only two thousand three hundred yards from the gun-boats, yet, strange to say, they never fired at us in the boat, though so much nearer than the ship. The Russians certainly deserve credit for their work here. They have ready twenty-three fine screw gun-boats, larger, I think, than ours; some with three heavy guns each, with a range equal to that of the heaviest gun we have, and yet they have only had machinery of railway engines to fit in them. They had to-day inside the dam and the shallow banks moored in line as block-ships seven two-deckers, seven large frigates, and five corvettes, and with them, ready to move anywhere along the dam, twenty-three screw gun-boats, beside many row gun-boats and thirteen small steamers from Merlin's size downward; while inside, ready to act also where required, are a screw-frigate and four paddle-frigates with main-deck guns, beside two or three sloop-steamers. The whole of this force is guarding the passage of the dam and shallow water. To force this and make a gap in the dam, etc., we have at most fifteen gun-boats and one or two small steamers; all others draw too much water to go near enough to help. Even if the two floating batteries come, they would never stand such a tremendous force. But without beating off their entire force and removing a part of the dam we cannot get a mortar-boat ... within range of the place. Yet there are wiseacres who abuse us for not taking Cronstadt, as if we could prevent shallow banks, and a dam twenty years old on these banks, keeping us at a distance, or could by any means carry our large ships (drawing twenty-five to twenty-seven feet) over ten feet water which separates us from their heavy force. It would be exactly the same as if in the Sea of Azoff the Russians had a lot of line-of-battle ships, frigates, steamers, and gun-boats, where the water is deeper, and we could only get in the small steamers and gun-boats drawing under fourteen feet water, which depth must be passed at the entrance. Were that the case, could we possibly have sent a small force into it? Sunday, 24th. - A nice quiet day, as all our Sundays now are. Admiral Seymour and Captain Louis are going on favourably, and are, I hope, out of danger. Monday, 25th. - Last night we had a heavy thunderstorm. The fleet remains very healthy; no symptom of cholera, as last year at this time. On Friday I went with Boyd of Royal George, who had slung a thirty-two-pounder in a coaster, to try its range against the new earth fort on the north side. At four thousand four hundred yards the shot went on shore; but, to our surprise, the battery fired in return, and actually threw the shot out close to us, full four thousand four hundred yards; so they have as heavy guns and longer range than anything we have, as these guns were fired from carriages. On Saturday we went in Merlin with the French and English admirals to look at the south side again, and to get as close as we could towards the south shore; but the hint the guns had given us the previous day made me keep four thousand two hundred yards from Risbank, instead of three thousand five hundred yards, as we did the last time we went. We found the banks, as usual, with less water than we expected, three fathoms only, just outside the four fathoms line of the chart. We then steamed across, keeping four thousand two hundred yards from the fort, and stopped in the middle, having a very good look, it being a very clear, beautiful evening. Risbank fired a shot at us in a perfect line, but three or four hundred yards short. We steamed ahead a little, saw them give the gun more elevation, and the next shot dropped a little astern, but exactly in our wake. Alexander fired also, but did not reach us by two hundred yards. They seem to have these long-range guns everywhere. We had heard that there were many much larger 'infernals' on that side; some with thirty-five pounds of powder, which would certainly blow Merlin's bottom in; but we had three gun-boats to pick us up, if necessary. There were many speculations on the probability of her not coming out again, or having to run on a bank before sinking. The French admiral congratulated himself on being able in that event to reach the main-mast head, which would be well out of water. They are probably inside, more where ships would go if attacking the forts. Admiral Seymour was pulling about in his gig last evening; he seems not to have suffered in health, but fears the sight of the eye is gone; he can only see a glimmer of light. 'Merlin,' Inside Dago, Sunday, July 22nd, 1855. ... I have always been particularly anxious, as you know, to make Cronstadt our point; but that being out of the question, I have urged Sweaborg as the next important point, and have never varied. There have been other points talked of, and some doubt in the admiral's mind whether we can do anything of importance or worth the expenditure of shell, etc. The French chief has wished to bombard Helsingfors, the town at Sweaborg, and not the fortress. This, I think, would be almost a cruelty, to destroy private houses, churches, observatory, etc., particularly with a large fortress, full of docks, buildings, barracks, etc., close at hand - a legitimate object of attack. Nargen, Thursday night, July 26th, 1855. I have busy times, all to prepare for leaving this to commence buoying Sweaborg on Monday. It is an anxious time for me, having urged the attack so much, and the chief saying he is very doubtful of success, and allowing his judgment to be against trying it; so that if we do no damage of consequence, I may have been the cause of a failure. But I am convinced it is the only thing we can try, and it ought to be tried, or the mortars, etc., will go home, having been useless. Sunday, 29th. - The French chief has been with me some time to-day. I fear he is bent on burning the town (Helsingfors) if he can, as well as the fortress. I suppose, as it is covered by the batteries, it is a legitimate object of attack; but I would rather show a more Christian spirit and spare it. Last Thursday week I went with the French and our admiral to Sweaborg, Key in Amphion and Dragon going near to look out for us, and a gun-boat and a French small screw with us. We had a good look at every part; went to Amphion's mast-head, anchored nearer Helsingfors, and had a good look from there, then to an island closer in. The enemy were in the act of sinking a two-decker to block the western passage, one having been sunk within a few days in the same passage. In turning to come out in one place, the French screw astern of us exploded two 'infernals,' but nearly twenty yards from her. Probably they were exploded by wires from the shore. They threw the water to a great height. The next day we went into Revel, and had a close look at all the batteries, several new ones of turf thrown a little back from the shore, so that we could not get within one thousand five hundred or two thousand yards with large ships, while the stone one advanced in the water had all the guns removed. They know well what they are about. The same evening I was off with two gun-boats to examine all the shores inside the large island of Dago and Ozel at the south entrance of the gulf, a large trade in boats and small craft having been going on from those parts to Sweden for salt. The next day (Saturday) we reached the sound inside Wormso Island, and I tried to go to Hapsal, a town you will see on the chart on the main, inside Wormso. It was too shallow about five miles off for Merlin to pass, having only eight feet, with large stones three and four feet high on that. But by looking over the bows for the stones, and steering between them, I got both gun-boats (drawing seven feet) through, and had then a good channel up to the town, within gun-shot, and we could have gone very much closer. There were no vessels and no defences, but crowds of people, with large parties of ladies with parasols of all colours. I should have gone in with a flag-of-truce to tell them not to be alarmed, had it not been for so much dispute about flags-of-truce lately. After a good look, and after catching a boat with a man and boy, and sending him away astonished (with some tobacco, coffee, and biscuit), we went out, little thinking what consternation we had caused. Hapsal is the 'Brighton' of Russia, and the chief bathing-place of the 'big wigs,' who come from the capital, Revel, etc., for the bathing in salter water. It is a pretty place, houses being mingled with trees, and a fine old ruin of a bishop's palace towering in the centre. On proceeding towards Dago, after lying quiet all Sunday, we followed a small cutter, about thirty tons, into a cove on the south-east point, finding a passage for the gunboats and Merlin six miles outside. I had been ordered to burn everything we found moving about, but not any vessels dismantled or hauled up. We set fire to the little cutter, which seemed more of a pleasure-boat than a coasting-vessel, and just after we saw a flag-of-truce on the shore. I landed and met a gentleman driving down in a handsome carriage and pair, a young man about thirty or thirty-five, who told me the vessel was his; that he was the Baron Sternberg, proprietor of nearly all Dago; that the island was defenceless, all troops having been withdrawn at the outbreak of the war; that there were fifteen thousand inhabitants, five thousand able-bodied men. He had been asked by the general commanding to organise them as a militia, but he declined, knowing it would only tempt attack, which must end in destruction of all property, and that he preferred trusting to our forbearance. He hoped we should not injure any private property on shore. I assured him we should not, and explained why I burnt the vessel, but left a larger one near her, dismantled, uninjured. He allowed that losing the vessel, which was his, was merely the fortune of war, and I told him I was glad she belonged to him and not to a poor man. He said that his castle was only three miles off, and he hoped we would visit it (he spoke English pretty well). I could not then, as I wanted to push on. The next day we went in the gun-boat round the shores of Ozel and Dago. We landed at one nice-looking farmhouse in Ozel; found only a very old woman with white hair, a cripple, and a man and woman servant, sheep, cattle, and horses. We saw a man drive off in a carriage - I suppose the proprietor. The man came down with us, and we gave him some coffee and sugar for the old woman, and some tobacco for himself. There was a fine flock of geese, which he was willing to sell; so we drove them to the shore, and made a circle round them with Creyke, Hewett, Lord D. Cecil (commanding a gun-boat), and the boat's crew. There was one fine brood of young ones, nearly full-grown, which I picked out, and then we rushed in on them, and geese, officers, and men were sprawling together. I got my pair of the fine young ones, and all got a good handful but Hewett, whom, after the chase, we found holding between his legs a gosling about the size of a young chicken, which was all he had succeeded in catching. We gave the man a shilling each for them, with which he seemed well pleased. After coming round to the cove where we burnt the cutter (about 2 p.m.), we saw the baron's carriage down again, and on landing he introduced me to the baroness, a young, nice-looking, delicate lady of about twenty-two years of age, who spoke very good English. They repeated the invitation to go out to their castle; so I got in alongside the lady, the baron mounted the box alongside a great Russian coachman in a long blue robe, a funny hat, and a splendid beard, and with two very fine horses we started, going first to the farm near, to provide a conveyance for Creyke, Hewett, and Cecil. They got a little hay-waggon with one pony, in which, after two breaks-down, they reached the castle about twenty minutes after we did. It is a splendid house, shaded over the entrance by fine horse-chestnuts, beautiful grounds round, and inside like a handsome English country house, but that there are polished oak floors, except in the drawing-room, which is thoroughly English, and inside it a perfect bijou of a boudoir, which the lady took me into through the drawing-room; and I almost thought myself in fairyland, so beautifully was it fitted up with green velvet, etc., but nothing gaudy. Inside this was the lady's dressing-room, which I cannot report so particularly on, except that the glimpse I got of it showed it to be in keeping with the boudoir. It was a very hot day, but a nice little breeze, though the thermometer was higher than they have ever had it before. Outside that front was the garden; the flowers, just the same kind as in our gardens, were rather poor, but the roses numerous and beautiful, and we got fine bunches of them. The stables were very good, and full of fine horses and stout island ponies about thirteen hands high. Her favourite English mare, which she showed me, was a great beauty, and I should think thorough-bred; she had also a very nice island pony for rough work and for hunting. There was a very fine English riding-horse of the baron's, a pair of English carriage-horses, and the handsome Russian ones we drove out with. It really all seemed like a dream: three miles inland in an enemy's country, and going over all these quite English-like scenes, with a nice young lady speaking; as good English as I did, except the slightly foreign accent. She was born at St. Petersburg, and only spoke Russian as a child, but had been entirely educated by an English lady, a Miss Meara, who seems to have remained with her till her own marriage about two years since. The family consists of one pretty little girl about fourteen months old, who was at first rather frightened at me. The lady, though nice-looking and very intelligent and sharp, is too delicate to be very pretty, and is very thin for so young a person; but she said she was very well able to walk and ride, and the people in the island are generally very healthy, there being only one medical man to the fifteen thousand two hundred inhabitants, and she thought they might do better without him. She expressed surprise at our not having burnt Hapsal. I asked her if she thought us savages, to destroy defenceless towns. She thought we would do so, and instanced Nystad and Lovisa this year, besides all the wanton destruction of property last year. The latter I could not defend; but I told her that Nystad was perfectly uninjured, that Lovisa had been so protected by Yelverton that at the request of the people he would not even burn the government stores, but destroyed them as much as possible, fearing, if fired, it might spread to the town, but that the same night a house in the opposite direction caught fire and burnt down all the town except the government stores, the burgomaster explaining that the fire was caused by a woman throwing out hot ashes or some such accident. I also pointed out to her that Yelverton at Ekness last year would not allow a shot to be fired at the town, though the batteries near it were firing at him, and Port Baltic and Fredricksham were quite at our mercy also. She said that Hapsal was full of the principal families from St. Petersburg and elsewhere last year, and also this, they thinking the shallow water would prevent our going up to the town. This year, fearing Revel being bombarded, many ladies from there went to Hapsal, including the wife and daughters of the general commanding, and she thought our going so close must have frightened them sadly. She had a sister there, and as the post would be over in two days (if we did not take it, which I promised not to do), she would hear everything. We had a splendid dinner, but more plain meats, game, etc., than I expected. Coffee and tea were carried out under a tree, and we left about ten, just at dusk, the baron driving me at a rattling pace in a light phaeton with the English horses and a thorough English-dressed groom, leather belt, boots, and all. The others came in a Russian carriage with the big coachman driving four large ponies abreast, with three reins in each hand. I asked them to come on board Merlin if she came close in, and I promised to come near the east shore on our way back, where the water is deeper and a road from the castle runs to a jetty where the boats from Hapsal land. When we reached the gun-boats, we found the crews arming to come out to the castle, thinking we were made prisoners, from being so long away. I hope I may never have a worse prison or a more unpleasant jailoress! The baron told me that the salt trade in the boats was carried on by the poor fishermen of the islands, who were dependent, as are many of the inhabitants, on the salt fish for winter food, and who suffered much last winter from want of it, or from eating fish bad through being too little salted; so they risked anything to prevent suffering so again; but several boats having been lost with all hands, and numbers taken by Porcupine outside, they dare not continue it. He assured me that no salt went to the mainland, as it was too necessary to the poor people, and he urged me to ask the admiral to let them have salt for their fish, and he would pledge his word none should be sold or taken to the mainland. I pointed out to him the difficulties in the way of making such an exception to the blockade. He said the rich did not feel the blockade, as all necessaries, such as coffee, sugar, tea, etc., and particularly all luxuries, were only increased a small percentage in cost by the land carriage from Memel and Austria, but that salt could not be brought that way, the carriage being so large a proportion to the price, and therefore the poor on the coasts were the sufferers. The next day I went to the southward, round the southeast side of Ozel, to Arensburg, the capital. Knowing there were no troops, I meant to have landed there; but it being dusk when I got off, and not liking to remain all night, I did not land, but returned to Merlin at 5 a.m. the next morning. We only saw one little vessel afloat and fitted out, and I was going to burn her, but reflected on the poor man seeming so distressed, and made them promise to haul her up. We weighed in Merlin at nine, after I had had three hours' sleep, and I went towards the part of Dago on our way out that the baron told me was nearer their landing-place and deeper water. We anchored some way off, but could have gone close in with a foot of water to spare: the gunboat could lie alongside the jetty. We found the baron down in his carriage, but no baroness; he came off to lunch, and when I took him back I found he expected me to go out to dinner, and had brought a large carriage to take us. I told him I could not wait; but he seemed to expect it so much that at last I agreed to go out for a short time and to say 'good-bye' to his lady; so Cecil and I started with him. The first road for a mile and a half was good, and led through an avenue of weeping-birch, and the four ponies abreast went away at a tearing gallop, which was very well till the road got uneven and stony, little sharp pitches up and down hill; and then, when they still tore on at the same pace, I wished myself out of it once of twice, particularly when dashing round corners and into the park through gates at the same pace, and with a double turn round the terrace up to the door. I never saw such fearful driving. The new leader, that is the outside of the four, was a beauty. They are very hardy, and rarely get tired, so he said. I found a nicely-dressed, lady-like woman and her husband (who is only a better-class farmer) there to meet us, and we so far dined with them that we sat at table; but having all the officers and the lieutenants of the gun-boats to dine with me on board at six, I having just made a good lunch on board, I could not of course have anything to do with dinner. The baroness told me that she had not come on board, fearing to compromise her husband, who would have sufficient reasons to justify his going, it being necessary to establish friendly relations with the ships, as the islands were unprotected, but her going would be quite a private act, so she thought it better not to. She had heard the day before from her sister at Hapsal. When they saw us pass the shallow water, they thought it was all over with them. Several ladies started off immediately; others began preparing and packing up. And when they found we were within gun-shot and went away, they could only believe it was to bring up the larger steamer, as they thought it impossible we should spare the town when we got close to it; so they went on packing up, preparing carriages, etc., and stationed men on the church-tower to report when we were returning. Their grand ball was that evening, and some did not return for it. When on Sunday morning they found we were farther off, they thought they were safe; so they had a thanksgiving service and a grand Te Deum in the church for our having spared the town. I sent a message to the ladies, which she promised to write to her sister - that they ought to have sent off and invited us to the ball and also to the Te Deum, and that I hoped to pay them a visit again, when I expected an invitation to land. She tried hard to get out of me whether Revel would be bombarded, so I let her rather fancy it would. She said she hoped their house in the Domberg would escape; and I told her I knew the Domberg was the west end of Revel (she knows London), and therefore it ought to have an extra share of shells, because the owners could afford the loss. A house her father had given her on her marriage outside the lines had been pulled down last year with a suburb of the best houses, and that is where they are now constructing so many earthen batteries. She hoped I might be able to visit them when at peace, and bring you with me. She was writing to Miss Meara an account of our visit, so I offered to send the letter in our mail-bag. She at first thought it would not do, but the baron said it would be a good joke, and she gave it to me to send. I told him I thought a ship would be stationed there later on in the season to blockade inside. They hoped it would be ours, as a stranger might not treat them so civilly, and they promised me plenty of shooting and fox-hunting, the latter consisting of foxes being, carried to an island where they cannot escape and only run a mile in any direction, and sending their horses and hounds over there for the month of September. If we had been two or three days sooner, we might have made their acquaintance under different circumstances, for they had crossed from Hapsal in their sailing-boat, and were becalmed eight hours on the way. What a chance to have made prisoners of a real live baroness and baron! It would have been a great catch. I have promised her a passage across to Hapsal if we return, providing she takes me on shore with her to see her friends. You will recollect our catching a boat full of women off Revel last year, and sending them away quite delighted with a Bible, tracts, tea, sugar, etc. The baroness was at Revel at the time; many were watching our proceedings and among them the Grand Dukes, who sent for the women. afterwards, and they showed some of the 'little books' I had given them. The women got plenty of presents from different people, so it was not a bad day's work for them. On my way back here I called at Odensholm, where you will recollect the men lived to whom I gave a Bible as a sort of pass to protect them from capture with their salt from Faro in April. They were very glad to see me. We got some milk and eggs, but the man whose boat it was would not let me pay for the milk we had. I trust with God's protection my next may report our successful bombardment of Sweaborg, for which I believe I start to-morrow or the next day to buoy and prepare for the force following the day after, but we can only do much damage to fortress, buildings, stores, barracks, etc. The admiral is most kind, and treats me with very flattering confidence, approves of nearly everything I suggest, and yesterday, when asking me how I was, as I have been a little unwell for some time, he said very kindly, 'You must not be ill just now. What should we do?' I may mention this, as it is only for those to read who will, I know, see how strictly private any remark of this kind must be kept. But I am sometimes rather puzzled by it, for all my brother-officers seem to think I can arrange everything, so they come to me. 'What are we going to do ? Do get me there'; 'Do put in a word for me'; 'Don't forget I have two sixty-eight-pounders'; 'Don't forget I have two ten-inch'; 'I draw only sixteen feet water'; 'Don't leave me out, there's a good fellow.' All quite as if I could arrange things even on points that I am careful not to interfere in, and I am always afraid of giving offence to some, though I try not to say a word on these subjects except on purely public grounds, and where I think it best for our success. ... I honestly try to suggest the best ships for the service, without caring for my friends. I do believe I can keep clear of all bias. Monday, 30th. - We start to-morrow morning. My poor friend Key, who has been stationed off Sweaborg all the summer, and was to have been with us, has come in with main-shaft broken: the ship will not be ready for a week. I have asked the admiral to let him go with us without his ship in some capacity. I am now waiting for the French admiral, who is coming here when he leaves our flag-ship. Tyringhame, Prestonkirk, N.B., July 2nd, 1855. My Dear Sulivan, - I am sorry to miss to-morrow's post in thanking you for your most kind and welcome letter. There is no mistaking the sincerity of your congratulations, or the cordiality and warmth of your expressions, to what relates to your own good wishes for myself, and your grateful feeling for anything I may have been able to do in advancing your strong claims. My service at the Admiralty, as you well say, has been long and hard. I can scarcely yet believe in my liberty, nor is it yet altogether complete. Of course the incessant toil of the post I held has told upon me, and some repose is required. I hope it may set me up. Such genuine wishes as yours greatly aid in the operation, and they have been far more abundantly and warmly bestowed upon me than I could have expected. It is a very generous payment and acknowledgment of a very poor attempt, during a long spell of office, to do as I would be done by. Your letter was begun just before starting for Sweaborg with a flag-of-truce, and it contained the first intelligence I had of the officers of the Cossack being safe. Your account of the infernal machines, too, was very interesting; and notwithstanding your wily way of saying nothing about Cronstadt, concluding that we should hear everything, the little you did say, and the observations you make, comprise more real information about the place than anything I have yet seen. I do pity you, if, from want of proper means and appliances, the services you and others might render should fail of being turned to their proper account. I only wish that your admirable commander-in-chief will forget Whitehall, if circumstances should ever seem to offer of possessing himself of appliances that he has failed to receive from England, and that no consideration of cost or fear of rebuke would for a moment deter him from making himself master of them. Dear Sulivan, - It is very gratifying to find the Merlin at every advanced post, and that our surveying-ships lead the way and are sent on missions of confidence on every occasion. The prominent position you occupy, and the kind terms in which the admiral speaks of your services, are very encouraging, and cannot fail, I should hope, in bringing their just and well-earned reward. I trust the means sent out will enable you to bombard, otherwise there seems to be no chance of anything of importance to be done in the Baltic, beyond the blockade and the distracting the attention of the authorities and the troops from the south. The Russians have shown much energy in building thirty screw gun-boats during the last year; the engines have been chiefly made by the American locomotive company who work the railway to Moscow, and not by Baird - at least, so our last information from St. Petersburg says. Baird has long been a Russian subject, but I rather think he refused to make them. At this time a number of honours were distributed, Captain Sulivan being made a "Companion of the Bath." Source: Henry Norton Sulivan: "The Life and Letters of Admiral Sir B.J. Sulivan K.C.B. ", John Murray, 1896, 298 - 317.